Your initial suspicions are right. It is ‘James Pond’, in fact it’s the third game in the ‘James Pond’ series. He was some sort of fish, IIRC – never had interest in the game. 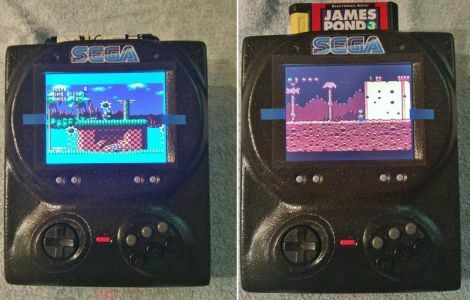 Personally I preferred “James Pond 2: Codename RoboCod” on the Amiga. I was reading a post here this week about 3D printers and how the projects collaborate. Wouldn’t it be great if the same happened with console hacking? For instance, I remember a few months ago there was a better audio circuit for the genesis posted — wouldn’t it be cool to incorporate that into a Genesis portable? I was contemplating doing that originally, but Drakon who had done the mod himself made a valid point that to really enjoy the mod, it had to be done outside of the range that portable speakers could handle. Why go though the expense and time to do it if you’re not gonna be able to really utilize it to the fullest potential. As for you’re 3D printing, that would be sweet! There are very few limitations now and it’s the first step to teleportation! haha. Oscarv wrote a reply on PiDP-11. salec wrote a reply on project log Back to the beginning: ADCMP606 w/ 120 ps edges. Paul Crouch liked "Straddle Crane" Self-Balancing Robot. raasmith liked Sawppy the Rover. c liked Particle Powered Air Quality Sensor.